The Kaurareg people know Hammond Island as Keriri and are believed to have occupied this area prior to first contact with Europeans. Hammond Island is located in the Southern or Prince of Wales Island group of the Torres Strait. For thousands of years the Kaurareg followed traditional patterns of hunting, fishing and agriculture, and maintained close cultural and trading ties with the Aboriginal groups of the Northern Peninsula Area of Cape York. These close ties continue to exist today. Captain Edwards of HMS Pandora named Hammond Island in August 1791, as he travelled through the Torres Strait with the captured Bounty mutineers. In 1802, the British navigator Matthew Flinders, in charge of HMS Investigator, sailed past Hammond Island. He noticed camp fires burning on the island but did not make contact with the Kaurareg people. In August 1864, a government settlement was established at Somerset at the tip of Cape York. The police magistrates of Somerset were hostile in their dealings with the Aboriginal people of the Northern Peninsula Area of Cape York and the Kaurareg. In April 1869, the crew of the cutter Sperwer was killed after the ship anchored off Prince of Wales Island. Government authorities determined that ‘the Korrorega natives’ were responsible for the killings. Three Kaurareg men were captured, found guilty of the Sperwer killings and executed by a party of native police led by Somerset police magistrate Henry Chester. Frank Jardine, Chester’s successor, led additional retaliatory attacks against the Kaurareg people on Prince of Wales Island during the 1870s. In 1872, the Queensland Government sought to extend its jurisdiction and requested the support of the British Government. Letters Patent were issued by the British Government in 1872 creating a new boundary for the colony which encompassed all islands within a 60 nautical mile radius of the coast of Queensland. This boundary was further extended by the Queensland Coast Islands Act 1879 (Qld) and included the islands of Boigu, Erub, Mer and Saibai, which lay beyond the previous 60 nautical mile limit. The new legislation enabled the Queensland Government to control and regulate bases for the beche-de-mer and pearling industries which previously had operated outside its jurisdiction. During the 1880s, a pearling station operated on Hammond Island and in 1889, gold was discovered on the island. A number of prospectors and miners began moving to the island in September 1889 and these deposits were quickly exhausted. An Aboriginal reserve was gazetted on Hammond Island by the Queensland Government in 1881. J F G Foxton, W E Parry-Okeden and Dr W Roth were appointed trustees of the reserve in February 1900. The majority of the Kaurareg people were moved to Hammond Island in the first decade of the 20th century. The Annual Report of the Chief Protector of Aboriginals for 1913 stated that around 80 Kaurareg people were living on Hammond Island, comprising ‘representatives from all Islands adjacent to Thursday Island’. Strenuous efforts were made by the government in 1913 to encourage the Hammond Islanders to move to a new settlement on Moa Island, but without success. The Kaurareg people on Hammond Island were neglected by the government and received no school or medical facilities. Thirteen people died the following year, when an influenza epidemic swept through the island community. By the 1920s, the Queensland Government was determined to move the Kaurareg people from Hammond Island, publicly stating that their close proximity to Thursday Island encouraged drunkenness and immorality in the community. Preparations for the removal began in 1921, with the construction of new quarters at Adam village on Moa. In March 1922 the Kaurareg community was forcibly removed by the government authorities from Hammond Island and transported to Moa Island on a Papuan Industries vessel named the Goodwill. Three members of the Hammond Island community, who protested against the removal, were arrested without charge by police armed with revolvers. From the 1880s onwards, many Filipino immigrant workers living in the Torres Strait married local Aboriginal and Islander women. These marriages were conducted by the Catholic Church. During the 1920s, the presence of mixed race families on Thursday Island was an embarrassment to the government authorities, who were applying strict racial legislation to Aboriginal and Torres Strait Islander people. In 1928, the Catholic Church on Thursday Island obtained permission to establish a mission settlement for families of Filipino ancestry at Hammond Island. St Joseph’s Catholic mission station was officially inaugurated at Hammond Island on Ascension Thursday in 1929. The mission was administered by Catholic priests and nuns of the Sacred Heart Order. The families of Nicholas Sabatino and Joseph Kanak were the first to settle at the mission. Catholic families from other Torres Strait Islands were encouraged to move to St Joseph’s mission, where a Catholic school was opened in 1935. In 1936, 70% of Torres Strait Islander workers went on strike, protesting against government control over their livelihoods. The strike produced significant reforms including the establishment of a system of government consultations with elected Islander council representatives. The new island councils were given a degree of autonomy including control over local Island police and courts. The first Inter Islander Councillors Conference was convened at Yorke Island in August 1937. Representatives from 14 Torres Strait communities, including Hammond Island, attended. In 1939, the Queensland Government passed the Torres Strait Islander Act 1939, which incorporated many of the recommendations made at the conference. A key section of the new act officially recognised Torres Strait Islanders as a separate people from Aboriginal Australians. During World War Two, the civilian population of Hammond Island was evacuated to the Sisters of Mercy Convent at Cooyar in southeast Queensland. The mission buildings on the island were taken over by the army, and a RAAF radar station operated between 1942 and 1943. After World War Two, the pearling industry declined across Torres Strait and Islanders were permitted to work and settle on Thursday Island and the Australian mainland. However some mission residents returned to Hammond Island where they found that white ants had destroyed their church. Work began on the construction of a new Catholic church. In 1952, St Joseph’s Church was built on top of a hill overlooking the sea, using locally quarried stone and volunteer labour. In 1964, the priest and sisters of the mission were moved to Thursday Island. After gaining its independence from Australia in 1975, Papua New Guinea asserted its right to the islands and waters of the Torres Straits. A proposal was put forward to divide the Torres Straits between the two countries at a longitude of 10 degrees. The proposed division was completely rejected by the Queensland Government and the Torres Strait Islander community. In December 1978, a treaty was signed by the Australian and Papua New Guinea governments that described the boundaries between the two countries and the use of the sea area by both parties. The Torres Strait Treaty, which has operated since February 1985, contains special provision for free movement (without passports or visas) between both countries. Free movement between communities applies to traditional activities such as fishing, trading and family gatherings which occur in a specifically created Protected Zone and nearby areas. The Protected Zone also assists in the preservation and protection of the land, sea, air and native plant and animal life of the Torres Strait. On 30 March 1985, the Keriri community elected 3 councillors to constitute an autonomous council established under the Community Services (Torres Strait) Act 1984. On 21 October 1985, the council area, previously an Aboriginal reserve, was transferred to the trusteeship of the council under a Deed of Grant in Trust by the Queensland Government. In 2007, the Local Government Reform Commission recommended that the 15 Torres Strait Island councils be abolished and the Torres Strait Island Regional Council be established in their place. In elections conducted under the Local Government Act 1993 on 15 March 2008, members of the 15 communities comprising the Torres Strait Island Regional Council local government area each voted for a local councillor and a mayor to constitute a council consisting of 15 councillors plus a mayor. In the case of Kaurareg People v Queensland  FCA 657 at para 2, it was noted by Justice Drummond that ‘the Kaurareg were the original inhabitants of the islands of the Kaurareg Archipelago prior to and at the time of the claim of sovereignty made on behalf of the English Crown in 1770 by Captain Cook and thereafter In addition, the Kaurareg people currently have three active native title applications awaiting determination: Federal Court file numbers: QUD266/2008; QUD267/2008; and QUD362/2010. For a discussion on the history of Hammond Island, see N Sharp, Footprints Along the Cape York Sandbeaches (Aboriginal Studies Press, Canberra; 1992) 14, 106-108. Captain Edwards may have named Hammond Island after the Naval Officer, Sir Andrew Hammond, Queensland, Queensland Placenames Database, Department of Environment & Resource Management website, https://www.dnrm.qld.gov.au/mapping-data/place-names/search/queensland-place-names-search 25 May 2013. Sharp, above n 1, 35-40, 55-56. Author unknown, murder of the crew of the Sperwer, Brisbane Courier, 27 November 1869, 6; Sharp, above n 2, 57. Queensland State Archives, Colonial Secretary’s correspondence, COL/A153, 71/524; J Singe, The Torres Strait, People and History (University of Queensland Press, St Lucia,1979) 47, 168-169. S B Kaye, Jurisdictional Patchwork: Law of the Sea and Native Title Issues in the Torres Strait (2001) 2 Melbourne Journal of International Law, 1. Queensland Statutes (1963) vol.2, 712. See also Colonial Boundaries Act 1895 (Imp); Wacando v Commonwealth (1981) 148 CLR 1. S Mullins, Torres Strait, A History of Colonial Occupation and Culture Contact 1864-1897 (Central Queensland University Press, Rockhampton; 1994) 139-161. J Foley, Timeless Isle, An Illustrated History of Thursday Island (Torres Strait Historical Society, Thursday Island, 2003) 49. ‘Gold Discovery on Hammond Island’, The Queenslander, 21 September 1889, 551. Queensland, Queensland Government Gazette, 31 December 1881, vol.29, no.98, 1450; Queensland, Queensland Government Gazette, 3 February 1900, vol.73, no.29, 314; Queensland, Annual Report of the Northern Protector of Aboriginals for 1901 (1902) 18. Sharp, above n 1, 109. The Annual Report of the Chief Protector of Aboriginals for 1913 mentions that the Kaurareg were prepared to move from Hammond Island but wanted to be resettled at Port Lihou on the south east corner of Prince of Wales Island, which was part of their traditional lands. Queensland, Annual Report of the Chief Protector of Aboriginals for 1913 (1914) 13. Queensland, Annual Report of the Chief Protector of Aboriginals for 1921 (1922) 7; Queensland State Archives, Home Secretary’s correspondence HOM/J538, 1925/228, removal of Hammond islanders; A Shnukal, ‘Historical Mua’ (2008) 2, 2 Memoirs of the Queensland Museum, Cultural Heritage Series. Sharp, above n 1, 110-112; Queensland State Archives, Home Secretary’s Correspondence HOM/ J419, 1922/1962; Sydney Morning Herald 8 March 1922, 13; The Queenslander 11 March 1922, 17. A Shnukal, ‘Pre-War Filipino Communities in Torres Strait’ (2009) 23, 2, KASAMA. Sharp, above n 1, 181-186; J Beckett, Torres Strait Islanders: Custom and Colonialism (Cambridge University Press, Cambridge; 1987) 54. Beckett, above n 20, 54-55. N Sharp, Stars of Tagai, The Torres Strait Islanders, (Aboriginal Studies Press, Canberra, 1993) 210-214; Boigu Island Community Council, Boigu, Our History and Culture (Aboriginal Studies Press, Canberra, 1991) 135-136. A key section of the new act officially recognised Torres Strait Islanders as a separate people to Aboriginal Australians, Queensland, Annual Report Department of Native Affairs for 1939 (1940) 1; Sharp, above n 23, 214-216. Sections 3 (a) – (c) of the Torres Strait Islander Act (Qld) 1939. See also Queensland, Annual Report Department of Native Affairs for 1939 (1940) 1; Sharp, above n 23, 214-216. J Littleton, Sacred Heart Mission, Torres Strait 1884-1967 (Fyshwick, ACT; 2009) 65-67. For further information see the Department of Foreign Affairs and Trade website: www.dfat.gov.au/geo/torres_strait/index.html#brief; Sharp, above n 1, 226-227. Further information about the Protected Zone can be found at http://www.pzja.gov.au/. The Hammond Island Council was established under the Community Services (Torres Strait) Act 1984. The Act conferred local government type powers and responsibilities upon Torres Strait Islander councils for the first time. Queensland, Annual Report of Department of Community Services for 1986 (1987) 3; Queensland, Annual Report of the Department of Community Services for 1987 (1988) 29. 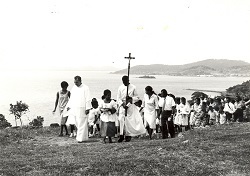 A religious procession on Hammond Island.